To display customer A/R balance, select the Customers icon from the main menu. 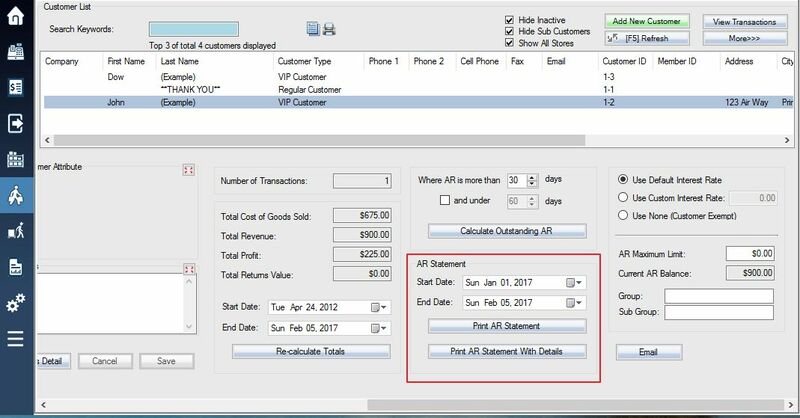 Select the customer whose account balance you would like to see, and it is listed in the Current AR Balance field. A/R Balance will also be displayed on the transaction screen during a sale. You can print a customer’s AR statement from the customer screen as well. As before, navigate to the customer screen and select the customer whose account you would like to view. With the lower customer screen scrolled to the right, you will see a box labeled AR Statement. Use the start and end date fields to select the period of AR activity you would like to include on your printout, and then select the type of statement you would like to print. will print a simplified statement listing each AR transaction on the selected account. will print a more detailed statement listing the items in each AR transaction.